I am so excited to travel the world with you and cook dishes from countries all over the globe on my new linky party: Food of the World that will be starting Sept 10th. Every second Tuesday of the month you get to link up the recipe you've chosen from the country that was selected the previous month. This way we get to explore different cuisines together! I will take your suggestions for countries to visit, so please put them in the comment section of this post. I will try to select cuisines by season and produce availablity, but of course, we won't be able to do this every time. Because it will still be warm in Sept. I'd like to being our voyage in sunny Spain. A country that is famous for it's tapas bars and of course, Sangria like I am sharing with you today. This Sangria was made with the Spainish equalivent to Champagne called Cava. It is delicious and refreshing... and a heck of lot cheaper than French Champagne. So enjoy researching Spainish cuisine and I will look forward to checking out what you cook come Sept. In the mean time check out one of these Sangria recipes. Mine came out a little pink because I decided to use Maraschino cherries in mine and I think I put too many. The original recipe is not quite as sweet. We have started to have a few cool nights and some rainy days. This soup is a perfect transtion into Fall because it uses seasonal corn with just a little bit of bacon to really make a flavorful soup. A recipe that uses fresh seasonal corn and peppers to create a visually pleasing and bright with flavor late summer dish. I hope you are in area that you can get a hold of key limes. We get them every once in a while and their flavor is amazing. You can tell from the picture that the texture of these cookies is amazing. This post is shared on the following food/craft parties. Please be sure to check them out. Thanks for hosting the party. I don't have a recipe from Spain but I hope you like my Asiago Soft Pretzel Buns. You have a month to find a Spanish recipe. The Food of the World party is separate from this one. It will be once a month on Tuesday. I hope you will make something for it. Your new Linky Party will be so much fun, I better get busy and find a recipe. 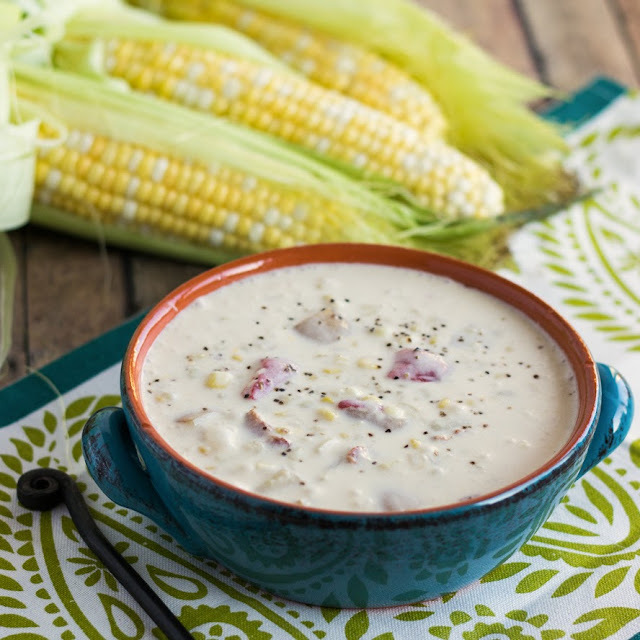 I love the looks of that Corn Chowder. Have a fun weekend and thanks for a great party! I am going to check out Spain right now. I think it will be really fun too and we might find a few new cuisines that we will really enjoy. Diane, around the world link party sounds like a blast! I have been wanting to try patatas bravas and this will give me the perfect excuse :) I think it would be fun for one of the link parties to make a pit stop in Thailand. I have know idea what patatas bravas are but I can't wait to see your recipe. Thailand is a must stop I will put it in the schedule. How lucky for them 3 years in Spain WOW... maybe you find a recipe from your parents? Hi Diane! I'm looking forward to your food of the world party. I think I have 1/3 of 3 countries in me and that's why I love to interchange ingredients from different cuisines into my dishes. It's going to be a fun get together! Thanks for hosting the party! Have a fantastic week! I had a friend like you growing up... she could claim so many ethic backgrounds we nicknamed her A1 sauce. Look forward to having you be part of the party. Ooh! I can't wait to see all the Spanish recipes. :) I'm not sure that I'll be able to participate, unless I can find a good (and easy) recipe that doesn't rely on pork. They sneak it into everything there! You can always alterate recipes to fit you dietary needs. I usually look at a bunch of similar recipes and then write my own. Thanks for featuring my soup! I love love love your new idea... Of course I love Italian food but how about Greece? I almost picked Greece for the first stop because of it's fresh summery ingredients. It is definitely going on the list. 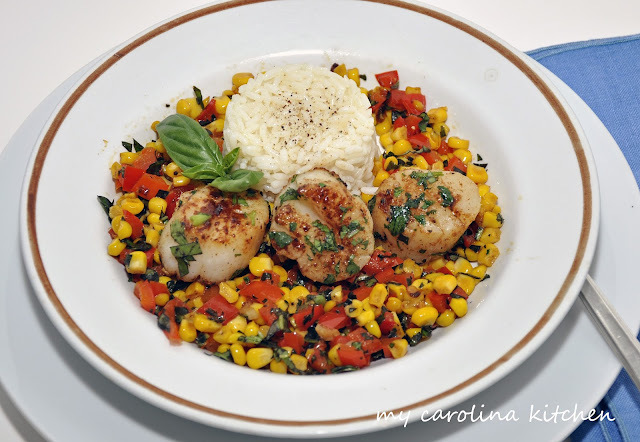 Thanks so much for featuring my scallops with corn & red peppers. I would love to visit Spain. We always threaten to when we're in France, but so far we haven't made it there. I'm looking forward to your world party. It's funny Sam I've been to a lot of European countries including Portugual, Spain's neigbor, but I've never been there either. The sangria sounds refreshing, especially with the heat we've been having lately. I can't wait for all the Spanish recipes next month! I forgot to mention you can subsitute the champagne with Fresca or that type of soda and it is delicious. I love your link party...Thanks so much for hosting Diane! Thank you Nancy, your part of the reason it is fun. I appreciate you coming each week. Believe it or not, I've NEVER had sangria...it looks so pretty! You have to try it on a hot day and what is great about it is you don't have to use quality liquor. I take Sangria anyway I can get it too... LOL. Hi, Diane. Thank you for the party! We've been going out of town on Fridays and getting ready for school so I haven't been by to link in sometime. Glad to be able to join in this week. I could go for some of your sangria this evening. NY seems to be the only state not going back to school for a while. We wait until after some Jewish holidays. My kids start on Sept 9th. Hope life settles for you a little and you get to try this recipe for sangria,.. all of the ones on the link look great. I can't wait to see what you bring to the Spanish party... I think it is going to be a lot of fun. Good to see you Lisa. I made vegan paella in a Dutch oven and I'm sure it would be great with your sangria. Your recipe looks great Mia, make sure you link it up with us on Sept 10th. I am late again. I have to live under the principle, "Better late than never." Now, is it time to drink the sangria? Absolutely, lets just say you are fashionably late and make it chic. 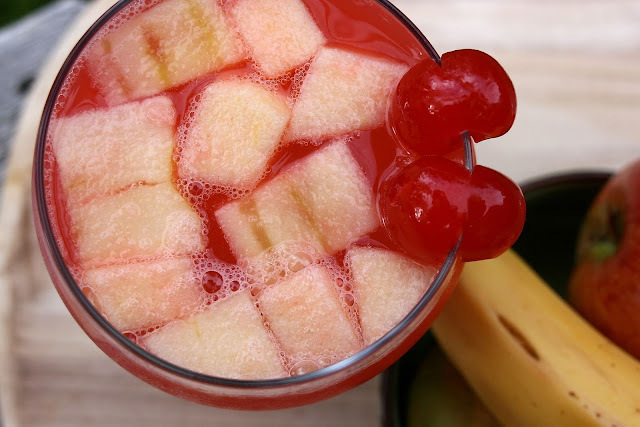 This sangria looks so good. A perfect summer drink. 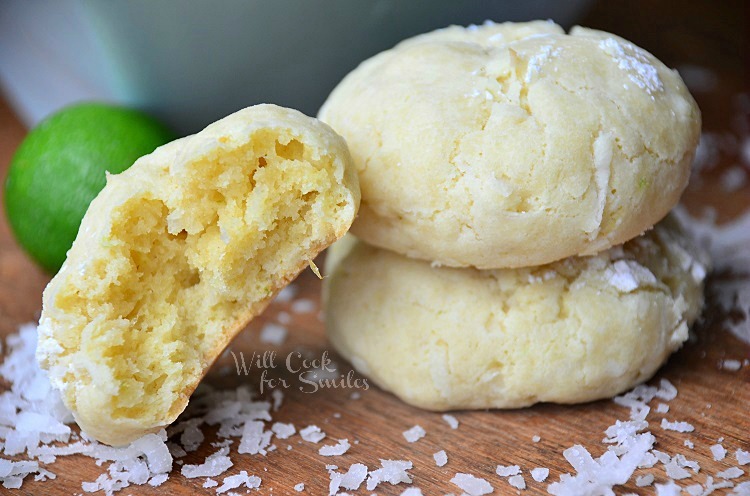 Thanks for sharing this at the In and Out of the Kitchen LInk Party. 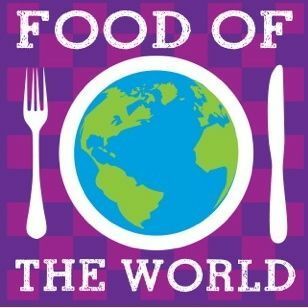 I cannot WAIT for your Food of the World link party to start! :) Is there somewhere I can sign up for emai l reminders??? I love the idea of Sangria made with champagne. It sounds delicious! The bubbles make it extra refreshing when it is hot. Have you tried Cava, the Spanish Champagne? I was really surprised at how delicious it was, especially with a few pieces of fruit in it... really wonderful inexpensive alternative, esp. for a picnic.